This is my first venture into the world of blogging! Many thanks Jim for having done all the work for me previously, for giving me instruction on how to take over from him and for the help I shall undoubtedly need in future! To say that this has been easy is a total untruth! What a nightmare! It is hit and miss whether or not the text wraps around the pictures and I lost the toolbar which enabled me to make a picture a different size. Some of them could do with being larger! What looks OK in the 'draft', is wrong on the 'preview' but I have given up on trying to improve on it for now - maybe another time! Bear with me, it should only get better!! If anyone can shed light on the toolbar problem I shall be happy to hear from you! Thanks to all of you who have wished me better health - it is on the way - I have turned that corner! I shall soon return to the fold and drive you mad with my taking of photos. Frances. Cath took me, Rachel and Allan to the Galloway Forest. I had opted to walk with them rather than with the Ramblers as I was not sure if I could manage today’s walk when Cath and Rachel lead it next Saturday as I shall be doing the recce with Florence and Brian next Sunday for our walk the following Saturday and don’t think I shall manage to do both walks. As it happened, I did not walk Saturday or Sunday. See end of my blog. Cath parked at the picnic area between High and Low Camer Woods and we walked a short way southwards along the road (I stopped to chat to a man with three Labradors, one of which is 14 (and black/grey) and the mother of the other two, both females, one black and one almost white) before turning off to the right and taking a path through Low Camer Wood, which was lovely. ﻿﻿﻿﻿We soon returned to the road and then turned off to the left to enter more woodland. Having missed where the track continued, we crossed over a burn and headed for a tall dyke. On closer inspection, we found it was accompanied by barbed wired fencing and Cath and Rachel turned to the map. After retracing our steps for a short way we mounted a small hill and could see the right track below us. We rolled under the fence which surrounds the deepest of the mine openings and explored what we could, in safety, returning the way we had come and continued onwards to find the building which had housed the wheel . There was another, larger building close by – housing perhaps? There followed a section of ground covered in tussocks, through the trees, before we came upon the vastly reduced water of the Silver Rig Loch, an artificial one which provided the water for the mine workings, evidence of which was discovered by Allan and Cath in the original outflow with remains of a wooden sluice system. More tussocks followed, accompanied by boggy ground, over which Allan and I really struggled. Eventually we reached an easier section and a dyke, beside which we walked until we reached a forest road (at Laggery Howe?). Last time Cath and Rachel had walked here, with Thomas, this had a better surface but it was evident that recent forestry had churned up the road. Click on this photo to get a better view of the sheep fold. There was a recent addition to it, turning to the right, which we ignored and walked between the piles of logs until we crossed the bridge over Pulniskie Burn. A fungus decease had necessitated the removal of larch trees which did open up the vista for us and created more opportunities to take photos, of the log piles and of the surrounding area. The waterfalls of the Pulniskie Burn were a great incentive to leave the forest road and I was in photographic heaven taking loads of photos here. 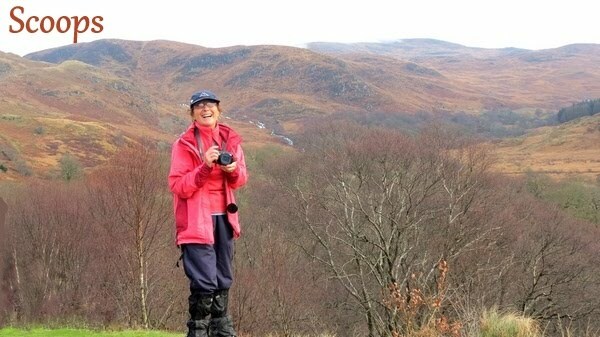 I am sure Rachel must have been kicking herself for leaving her camera at home – the last two wet walks having put her off bringing it! I caught up with the others after clambering over discarded branches and trying to avoid the brambles. They had left their rucksacks further down but I had not seen them as my eyes were elsewhere! We came back down, noting that the foliage on the other side of the burn with its waterfalls, was lower and they were planning to take the walkers on that side next Saturday and to stop over there for lunch. We found a grassy spot near the water and had our lunch, about 12.45pm, by which time I was extremely hungry! This photo is best viewed as a larger one! The forest road continued downhill and bore to the left. Soon afterwards we left it to join another track which eventually brought us to the Old Bridge of Minnoch. There was much evidence of the flooding which took place in December, with the rocks having been gouged away, close to the bridge. Woodpeckers had had a field day decimating a couple of trees nearby. We stopped for photos on the bridge before moving south eastwards, following the Water of Minnoch beside which dead vegetation could be seen high up in a number of trees, more testament to the wild winter weather. I had to keep moving quickly to catch up with the others as they moved on without me – the temptation to take more and more photos was overwhelming! Cath waited for me as we got closer to the parking area near Cashnabrock Weil. On gaining the road we turned left and followed it for a while before turning off to our left and taking this wide track for a short while. Rachel noticed where a track went off to the right and we followed this up to where we got really lovely views. As I climbed this section, tiredness and my aching body took over and I needed to sit for a while and take some painkillers. This done, and a short rest taken, we set off again, following a dyke before turning off, through it, to walk on its other side. Cath and Rachel were looking for some derelict buildings but these got missed and there was one short section where we changed direction slightly. Cath persuaded me to climb a hillock – Peat Crag or Bughtduloch Crag? from where the view was wide and good but the effort was a tremendous one for me. We returned to what was now a really good track which eventually brought us back to where we had parked the car. As we changed out of our muddy (not much) footwear we were joined by the same man and his Labradors, and his wife? She said her name was Carol and they live in the house opposite the picnic area. We think we may have persuaded her to join us next week but time will tell. We came back via Minnigaff. Cath and I went into Woodlea, in Sandhead and she had coffee, I had tea and almond slice, which was lovely! * This was to be a walk which I was leading but my energy has deserted me again. Florence, bless her heart, is standing in for me and Claire is her back up. On top of everything else, Florence is walking the whole length of the Mull of Galloway Trail, 24 miles, on Friday, to raise funds for the school in Chatra’s village, in Nepal. I am hoping to join them at its start, at the Mull, at 7.15am and walk with them to Drummore -far enough for me at the moment! Good luck to all those involved. The beautiful weather in the week must have encouraged an exceptional number of ramblers to turn out for the Saturday walk when 29 walkers assembled at High Camer Picnic Site. As the ground here was quite soft, it was with grateful thanks that the offer of hard standing in a neighbour’s garden was taken up by many drivers. The walk headed off south down the road, for a path leading through Low Camer woods. The restoration of these ancient oak woodlands is managed by the Cree Valley Community Woodland Trust, a local charity which is a partnership of expert representatives from official interested bodies. Set up in 1998 with a vision of managing the habitats of woodlands bordering the Cree ‘from source to sea’, in this wood it has provided interpretation boards which tell of the flowers, insects, and birds to be seen. Bird boxes and squirrel feeders were much in evidence, but the undergrowth had not yet started to show through the dead grasses. The splendour of the winter woodlands depended on views of the River Cree seen through a screen of gnarled and muted colours provided by the sleeping trees. Next an indistinct track was followed leading to the Silver Rig Lead Mine. A report by CFA Archeology LTD in 2002 contained a plan and interpretation of the mine which was thought to relate to three distinct phases. With this plan it was easy to see the open cast features from the eighteenth century; the following underground mining of the nineteenth century and the later technical innovations which included the remains of a waterwheel pit and its attendant lade system. The group spent some time exploring the remains before moving on over tussocky ground to Silver Rigg Loch, a man made, earth banked reservoir, which supplied water for the mine wheel. The loch was much silted with a boggy surface and only patches of open water, but the original outflow with remains of a wooden sluice system was found before the party moved on around the banks and once more into tussocky ground interspersed with woodland. After some rough walking, trying to keep to open grassland, a dyke was reached which now could be followed to a forest road. It is sad to see how many larch trees are being felled because of phytophthora ramorum, the fungus like disease which is now spreading rapidly, causing resin bleed and eventually a dying off of branches and then whole trees. A slight compensation means that the lie of the countryside is much easier to see; crags and hills have been revealed where previous views were negated by overshadowing trees. The green forest road had been ploughed up by heavy vehicles transporting timber, but the open path made rapid walking to a lunch spot by the Pulniskie burn. Former use of these upland pastures were demonstrated by ruined sheep pens set in particularly beautiful surroundings, with a series of waterfalls making delightful company for the ramblers at rest. Deep pools, water gliding over large flat rocks, tumbling along series of jagged outcrops and cascading down from higher falls delighted the photographers and made the lunch stop a rather protracted one. Back on the forest road the walk then led westwards to the river Minnoch and the Roman Bridge, a photogenic pack horse bridge which once took long forgotten tracks across the river. Here the damage caused by the flooded river during the winter was plain to see. The path alongside the bridge is undercut, river pebbles are strewn for long distances beside the banks and debris is scattered far and wide. This storm damage continued to be remarked upon as the company walked the east bank of the Minnoch back to Borgan Bridge and the road. The last section of the walk took once more to the Cree Valley Woodlands, High Camer Woods. An exploratory stop was made at the old farm steading of Camer, hidden amongst hazel saplings, dead bracken and brambles. From here it was a small step to the cars, but first an enormous badger set with numerous sandy openings was sought out, though no badgers were in evidence in the daylight and with noisy company nearby. Although the walk was only six miles long, it was tiring terrain and the ramblers were glad to retire to ‘Cinnamon’ in Newton Stewart, for a warm welcome and delicious refreshments. Next week’s walk is an 8½ mile ‘B’ walk in the upper Fleet Valley. Meet for car sharing at Breastworks, Stranraer, 9am. Riverside, Newton Stewart, 9.30am, or SNH Dromore Car Park, NX 555 638, for walk start at 10am. New walkers must phone walk leader for further information 01776 870441. All are welcome.